Über Cool is St. Louis’ German-themed party band that proves Oktoberfest isn’t the only time of the year to pull out the lederhosen. A five-piece ensemble that includes multi-instrumentalists, the group’s talent ranges from accordion-lead traditional Oktoberfest standards to the keyboard and guitar driven German pop music today. While there are a handful of bands across the U.S. that caterto traditional German heritage, Über Cool are unique in their choice of incorporating modern German pop; a choice that seeks to Germanize American tradition instead of the other way around. 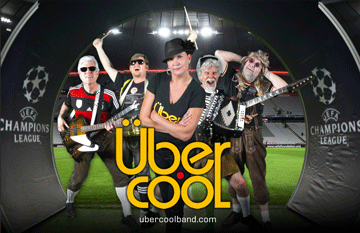 First and foremost, Über Cool are a self-described “Party Rock auf Deutsch” band and the central theme is always focused on lifting spirits and raising beer steins. If you want to explore German culture beyond the folk traditions and are open to festivities that have a little more culture, you might be cool. You just might be über cool.